For the woman who has a passion for the beauty of roses, this gift assortment will be sure to please. Unique idea for anniversaries, Christmas, Birthday or Valentine's Day. Arranged in a basket, a card with a message, wrapped up and ready for any occasion. A lovely, smooth hand or body lotion. You can be assured these roses were absolutely free of the use of pesticides. Should you ever visit an apiary take note the condition of the beekeeper's hands during honey season. Most likely they will be soft and smooth. Honey is a natural humectant which means it retains moisture. 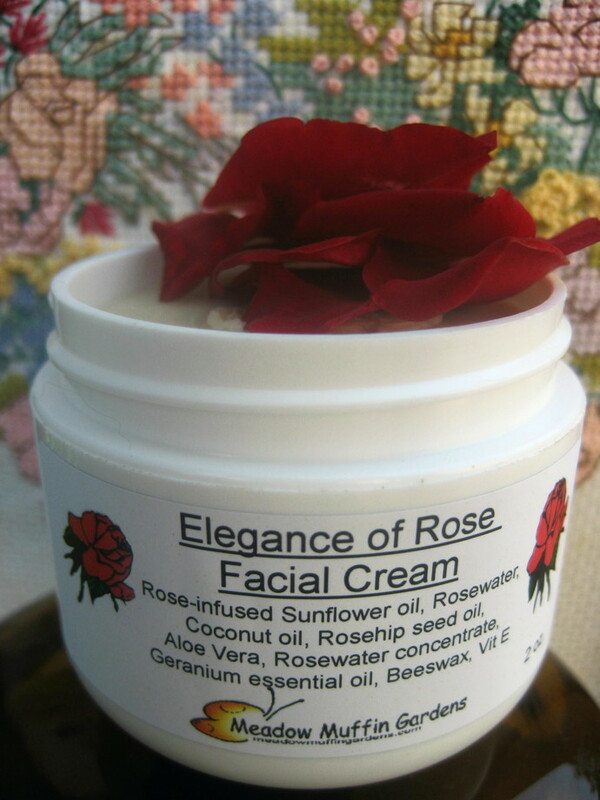 Wonderful for use in skin care to help with fine lines and revive tired skin. Ideal for those with sensitive skin. The roses used for the floral honey infusion are the pink Carolina Roses. 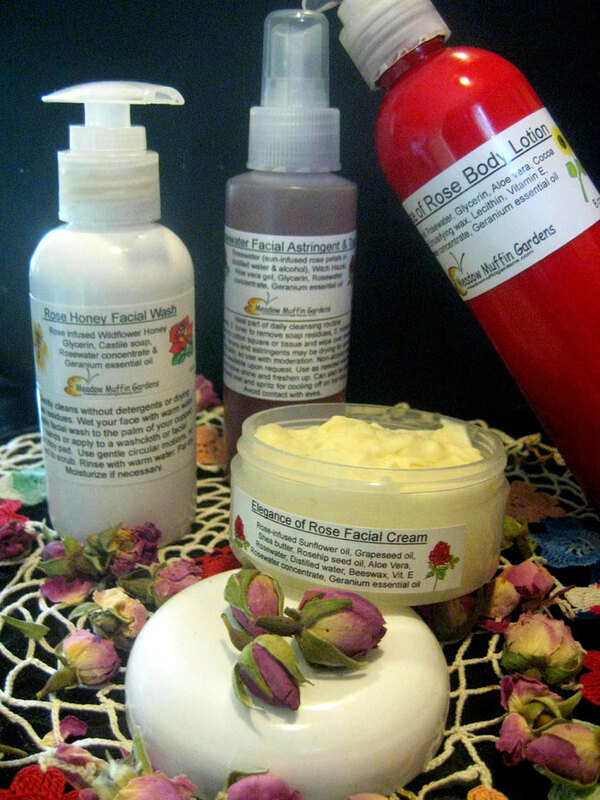 Rose petals contain an essential oil valuable in skin care and used for years by women in their beauty treatments. 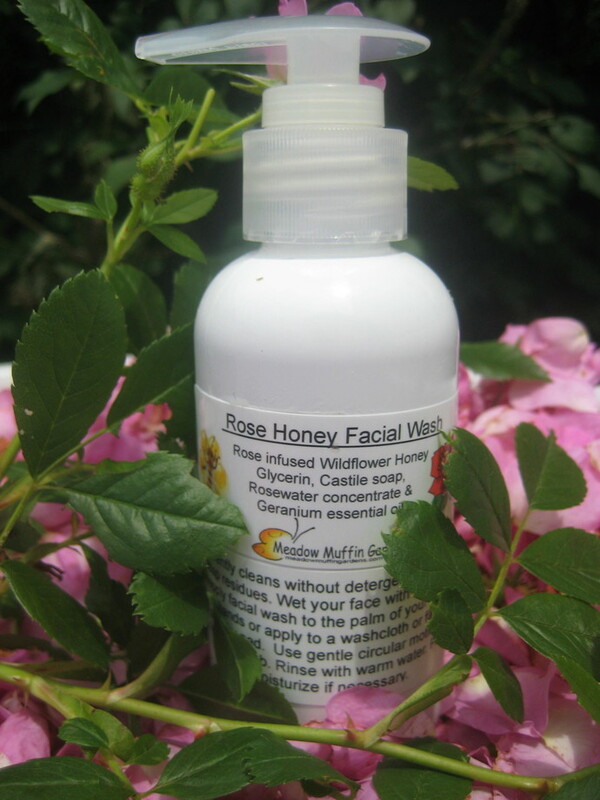 This gentle facial wash comes in a 4 oz. plastic pump bottle. 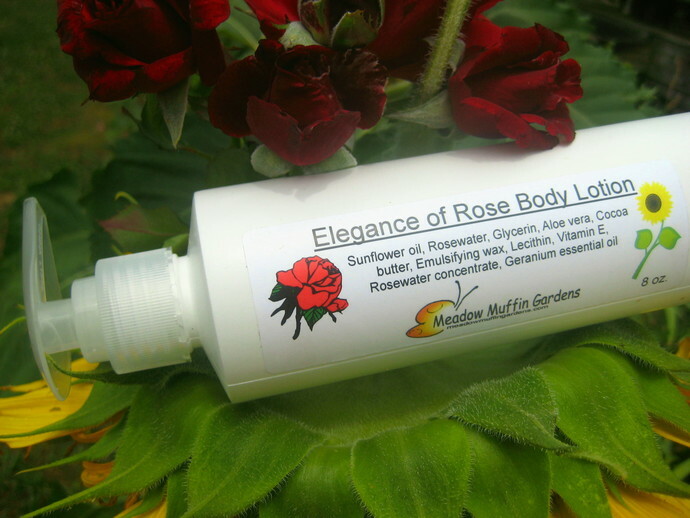 The type of roses used for this rosewater are the Hybrid Tea Rose type. They are either collected from my own bush or purchased from a reputable, organic supplier such as Mountain Rose Herbs. Infused with the heat of the summer sun, the result is a beautiful blush rosewater used for this refreshing toner as well as the creams and lotions. This astringent/toner comes in a 4 oz. plastic spray bottle. Skin loving sunflower, grapeseed, coconut and rosehip seed oils are a good choice for those with dry, sensitive, or mature skin. Use as a day or night cream. Remember it is very important to moisturize and keep delicate skin hydrated to help prevent wrinkles. This nourishing skin moisturizer comes in a 2 oz. plastic jar. Back in the day women would combine rosewater with glycerin to make a moisturizer they called "rosewater splash". For those of you who want a lotion rather than a liquid we've created our Elegance of Rose 'n Glycerin Hand and Body Lotion. Higher ratio of oil to water so a little goes a long way without the need to constantly reapply. This all over body lotion comes in an 8 oz. plastic pump bottle.